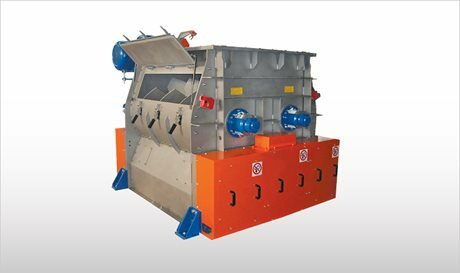 The WTS Batch-Type Twin Shaft Paddle Mixers achieves high quality mixtures in the shortest possible mixing time at the lowest energy consumption possible. The product is treated in the most gentle way and does not undergo any damage during the process. The WTS Twin Shaft Paddle Mixer is a batch mixer with two parallel drums, each with counter-rotating shafts equipped with paddles which promote a homogeneous mixture regardless of particle size and density, with the added efficiency of counter rotation of the overlapping paddles. The design provides gentle, low shear forces allowing, at the same time, a rapid mix at low energy consumption. Even with delicate and easily degradable products an intense mixing action guarantees optimum processing, without forming any fines. The mixer can be started under full load. With its special design and the arrangement of the mixing paddles on both shafts, the WTS Twin Shaft Paddle Mixer creates a fluidised zone. This becomes possible thanks to the two different technologies of mixing, the first one being turbulence, the second conveying. In combination with a low loading ratio, a freely movable mass occurs. In this fluidised zone, powders or granules will be optimally dispersed in a very short time, which is why the WTS Twin Shaft Paddle Mixer guarantees high level features in terms of homogeneity and mixing speed. The paddles of the WTS Twin Shaft Batch Mixer, with the added efficiency of counter rotation of the overlapping paddles, promote a homogeneous mix independent from particle size and density of the ingredients. The design provides gentle low shear forces though allowing a rapid mix with low energy consumption. WTS Twin Shaft Batch Mixers are used for dry bulk solids (powders, granules, short fibres), dry bulk solids + liquids (moistening, granulating, coating), as well as liquids + low-viscosity pastes.